A site in Zealand, Denmark, slated for residential development, has revealed traces of a late Iron Age settlement that had been in use for some 400 years beginning in the late 7th c. In addition to the remains of longhouses and pit houses, the ancient farm they are calling Vestervang has offered up a stash of Viking jewelry (SLIDESHOW HERE). The jewelry - some of it embedded with gold - would have been extremely valuable, so it has raised the curiosity of the archaeologists, who wondered why it was at such a modest agricultural site. But despite being raiders and farmers, the Vikings were traders, explorers, and expert craftsmen. 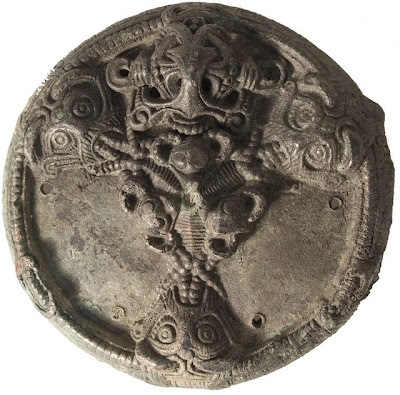 The discoveries include the 2.9" (73 mm) copper alloy medallion (PICTURED ABOVE) featuring 4 heads: "The neck is covered by a beadlike chain. Above the creature's forelegs, there are marked elbow joints and three-fingered paws or feet, which awkwardly grasp backwards to what might be hind legs or wings. In addition to the animal image, the item, possibly a pendant, also shows three masked figures, each with a 'drooping moustache.' [A] circular mark is seen between the eyebrows and above this, two ears or horns emerge, giving the humanlike mask an animal character," describes archaeologist Ole Thirup Kastholm.